Read more about the different types of jobs available at Against the Grain Farm and let us know if one looks right for you! We’d love to have you- fill out the form below with the dates and times that work for you and we will be in touch! Against the Grain is a small-scale diversified farm located 15minutes from downtown Boone in Zionville, NC. We live on a 35 acre farm and raise a broad spectrum of vegetables on a little under 2 acres. We also raise pasture chicken, turkey, pork, beef and goat. 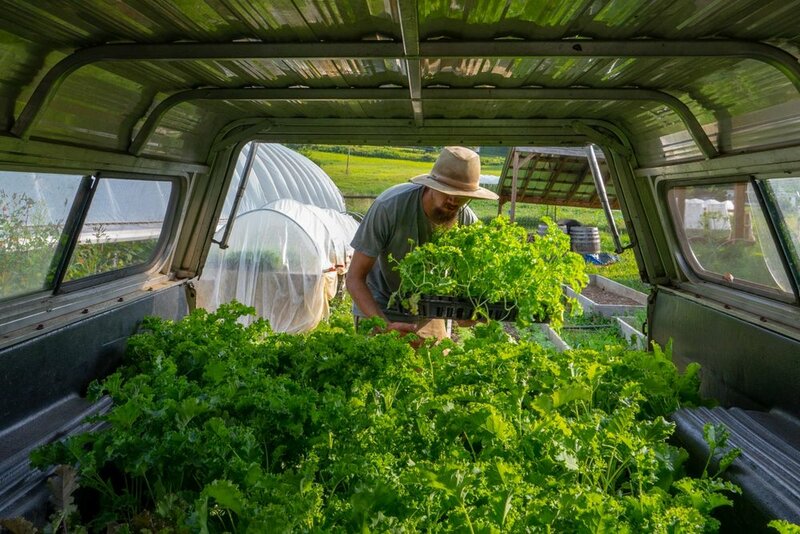 We focus on three main markets: 1- Watauga Co. Farmer’s Market and King Street Market (weekly farmer’s markets), 2- Vegetable and Meat CSA, and 3- several local restaurants and an online food hub. The 2019 season will be our eighth year in crop production and sixth year in animal production at our current farm place. We are continuing to refine our crop rotation, cover crop management, harvesting and composting techniques. Our focus at Against the Grain is to nurture the soil in order to grow high quality, nutritious food for our local community. We offer both part-time internships and full-time apprenticeships. Typically, part-time interns commute from Boone and provide their own housing. We are happy to accommodate part-time interns who seek school credit for their internship hours. We offer housing for full-time apprentices and anticipate that they will live on the farm so that they can fully immerse themselves in the farming experience. Occasionally, we have room to host a part-time intern for the summer, depending on housing availability. Are you interested in a part-time internship or a full time apprenticeship? When would you like to start work and how late in the season would you like to stay? Do you have a current drivers license? Please describe your experience driving delivery vehicles and/or stick shift. Have you had any vehicle accidents or major violations in the last 5 years? Do you own your own vehicle to drive back and forth to and from the farm? Please list any other skills that you have which might be applicable to this job, including experience with machinery, produce sales, retail sales, cooking, writing, animal care, social media, advertising, gardening or horticulture? Please describe why you would like to work on Against the Grain and what kinds of skills or knowledge you would like to gain from your experience on the farm? Have you lived or worked in community before? What are some things that you liked and didn’t like about your experience? Please describe your other interests or additional information that you would like to share.